Once upon a time October (Toby) Daye got turned into a fish and spent fourteen years trapped in a Koi Pond â€“ this, quite naturally left her with something of a distaste for bodies of water. So itâ€™s a bit unfortunate that sheâ€™s going to have to go to the Undersea Duchy of Saltmist to investigate the kidnapping of its two heirs. Harried by a new enemy, she has three days to find out where the lost sons of Saltmist are and who took them or the sea fae will go to war with the very much outmatched land fae. 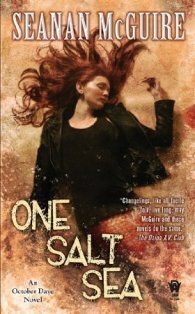 One Salt Sea is the fifth book in the October Daye series, and what a cracking addition it is. From start to finish the pace is kept high, the risk is great and the consequences fully explored. There are revelations about old characters that present a new level of tragedy to them, hints of long term mysteries waiting to be explored in future books and the previously unexplored Undersea duchy of Saltmist makes for a fascinating new location. While it helps to have read the previous books in the series, thereâ€™s enough background dropped into the story for you to get away without and for my money, this is absolutely the best one yet.